Sprinting requires precision as much as power and speed. 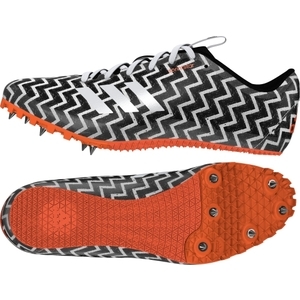 These men's track spikes are built for the technical sprinter. They feature a light, breathable SPRINTWEB mesh upper that locks the foot in place and a Pebax plate outsole for optimal energy transfer. Ideal for racing distances up to 400 meters. Sprintstar will blaze by the competition with ease. Weight: 173g (size 9); Recommended events: 60m, 100m, 200m, 400m, 4x100m, 4x400m. Reinforced mesh upper for maximum heat exchange; SPRINTWEB forefoot designed to lock the foot down during event-specific motions. Synthetic overlays designed to hold the foot securely during all phases of the sprinting gait. Designed for efficient power and technical sprinters. Pebax plate outsole for ultimate energy return and durability.